The camera phone megapixel wars are over, and Nokia won. How? 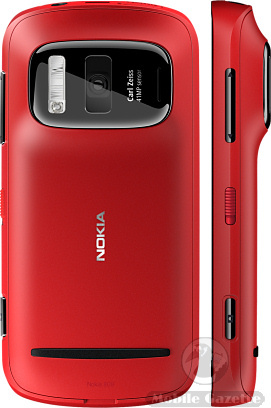 The Nokia 808 PureView is how - a Symbian Belle smartphone (although these days it is called Nokia Belle) with an astounding 41 megapixel camera sensor on the back. Yes, 41 megapixels..
Obviously, the camera is the main thing with the 808 PureView but before we get too involved in that, it might be worth having a look at the rest of the handset. Unlike many of Nokia's other recent offerings, this is based on the tried-and-tested Symbian OS, now called Nokia Belle. There is a 4" 360 x 640 pixel curved AMOLED touchscreen panel, 3.5G and WiFi support, GPS, an FM transmitter, Bluetooth, an HDMI output port and NFC support. There is 16GB of internal flash memory plus a microSD slot, and there are a wide range of built in applications plus many more you can download. It also makes phone calls. Now to the camera - the 41 megapixel sensor is enhanced with Carl Zeiss optics, but there's more to it than just megapixels. You might be surprised to find that the default picture size for the Nokia 808 PureView is just five megapixels. This is where Nokia's new PureView technology comes into play - the phone uses all those extra pixels for oversampling, and combines them all into a very sharp and clean image. It also means that the 808 can effectively emulate a lossless 3X optical zoom because it simply has so many pixels on the sensor. Alternatively, you can change resolutions and use up to 38 megapixels at a time for stills photos, and you can them manipulate them yourself, for example on a PC. The camera also comes with a Xenon flash plus an LED light for video recording, autofocus and touch-to-focus, and the video capture capabilities go up to 1080p video at 30fps with an emulated 4X lossless optical zoom. In addition, the 808 PureView has features such as face detection, a video editor and scene selection. Usefully, there is an optional tripod mount available for the 808 as well. You might notice that the camera sticks out a bit - the 808 PureView is 4mm thicker at the camera end, coming in at a chunky 18mm thick. It's also a little heavy at 169 grams, but then it's a lot less bulky then a dedicated digital camera. 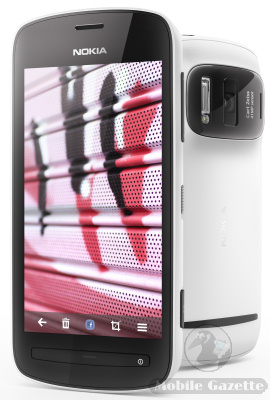 There is a rumour that the Nokia 808 PureView might be one of the last Symbian.. sorry, Nokia Belle devices to market. If that is the case, then it is an impressive way to bow out. It certainly shows that Symbian can do things that Windows Phone cannot, and perhaps it challenges Nokia's Windows-only strategy for future smartphones. At the moment, Nokia don't given any indication as to cost or availability for the 808 PureView, and given the unusual design and very high end camera we would not like to take a guess either.